One of the greatly revered books of our Gaudiya sampradaya, Prema Vilasa, vividly describes Sri Srinivasa Acharya’s appearance pastimes. Once upon a time ,while residing at Jagannatha puri, Sri Caitanya Mahaprabhu, had desired for the appearance of a great personality ,who would be instrumental in widely distributing the love of God. That very night Lord Jagannatha appeared in Mahaprabhu’s dream and apprised Him of a person named Caitanya das who was married to a chaste lady called Lakshmipriya. Both husband and wife had come to Puri and had prayed to Lord Jagannatha a few days back.Lord Jagannatha informed Mahaprabhu of Caitanya Das’ desire to have a son, and hence requested Lord Gaurasundara to kindly bestow His causeless mercy upon him. On waking up, Lord Caitanya ordered Avani (Mother earth) to fetch the whereabouts of Caitanya das. We all understand that, ‘yei Gaura, sei Krishna,sei Jagannatha’ .We understand that Lord Gauranga is non different from Lord Jagannatha or Sri Krishna. They are one and the same personality. Hence Lord Jagannath’s appearance in Mahaprabhu’s dreams and subsequently informing Him of Caitanya das, is simply a manifestation of Lord Gauranga’s magnanimous pastimes. He enacted this lila only to bestow His mercy upon Caitanya Das and Lakshmipriya devi, as we shall see below. Anyways, mother earth returned three days later and informed the Lord of Sri Caitanya Das’ residence, in the village of Cakandi (near Katwa) , in West Bengal. Thereafter on Mahaprabhu’s orders, mother earth bestowed the ecstatic love of Godhead, which she had herself obtained from Lord Caitanya, upon Lakshmipriya devi and blessed her to have a son.Soon Lord Caitanya revealed to all His intimate associates about the appearance of this great personality , who would come to be renowned as Srinivasa.The Lord also revealed that after His disappearance, this boy would come to Vrindavana and study the books written by the Goswamis and be instrumental in widely preaching them.The Lord wanted all of His associates to bless Srinivasa wholeheartedly. Soon Sri Srinivasa Acharya’s potency entered Lakshmipriya devi’s womb. 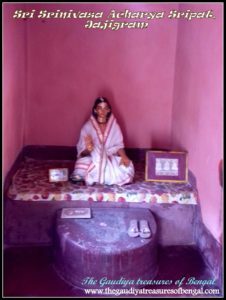 Lord Caitanya appeared in her dreams and blessed her.The Lord revealed to her that she was carrying a great personality in her womb, who in course of time would spread Harinaam sankirtana far and wide.Lakshmipriya devi became ecstatic on having darsana of the Lord and shed tears of joy. All auspicious signs gradually began to appear in their village. The villagers gradually took to chanting the holy names of Sri Krishna. There was one envious landlord in this village,named Durgadas, who was only attached to chanting the names of Shiva and Durga. Being envious of the widespread chanting of Lord Krishna’s names, he arranged for a drummer. He instructed the drummer to beat his drums and announce throughout the village that anyone who would not chant the names of Shiva or Durga would have to face punishment. But by mercy of Srinivasa, whenever this drummer beat his drums, the holy names of Radha and Krishna resounded from it. As a result more and more people took to chanting the holy names of Lord Hari. A few days later, by the Lord’s mercy, Durgadas’ heart got transformed and he himself took to chanting the holy names of Sri Krishna.He subsequently accepted Vaishnava initiation. ‘The Gaudiya Treasures of Bengal’ offers its respectful obeisances unto Srinivasa acharya who engaged in widespread preaching, even while residing in the womb of his mother. While Srinivasa was still a young boy, his father Caitanya Das fell ill with high fever, which didn’t break for seven continuous days. At the end of it, Sri Caitanya Das passed away. Unable to bear the sad loss of his father, Sri Srinivasa , along with his mother , shifted from Cakandi, to his maternal home at Jajigram. Jajigram is a small village situated near Srikhanda in Katwa. While residing here at Jajigram, Sri Srinivasa Acharya received the good fortune of associating with the devotees of Katwa and Srikhanda. He received instructions and blessings of prominent vaishnavas like Gadadhara Das (Please refer the article – ‘Sri Gadadhara das Sripat , Ariadaha’) who was then residing at Katwa, Sri Narahari and Raghunandana,who were the eternal associates of Lord Caitanya (Please refer the article – ‘The Great Vaishnavas of Srikhanda’), Sri Govinda Ghosh, who served at Agradwip (please refer the article – ‘Sri Sri Radha Gopinatha jiu ,Agradwip’) ,etc. All of these senior vaishnavas had previously heard of Srinivasa Acharya’s name from Mahaprabhu Himself, and hence they knew that Srinivasa was directly empowered by the Lord for expanding the Lord’s movement. Over time, Srinivasa became very dear to all the devotees, who by then had realized that he was not an ordinary personality. When Sri Srinivasa Acharya subsequently approached Sri Narahari Sarkar Thakura for receiving initiation, Sri Narahari revealed to him, that Sri Gopala Bhatta Goswami, who was one of the six Goswamis serving in Vrindavan, was his eternal spiritual master (Gurudeva) and hence he should at once travel to Vrindavana to seek his Guru’s shelter .How Sri Srinivasa travelled to Vrindavana is a very relishable and long pastime, that we shall try to narrate below in brief. Srinivasa Thakura desired to go to Jagannatha Puri, to meet Lord Caitanya, before proceeding towards Vrindavana. But by the arrangement of providence, Lord Caitanya enacted His disappearance pastime before Srinivasa could meet Him. Feeling utterly disheartened ,Srinivasa broke down and fainted on his way.The Lord then appeared in his dream and instructed him to seek shelter of Sri Gadadhara Pandita and learn Srimad Bhagavatam from him. Taking the instruction of the lord to his heart, Srinivasa reached the temple of Tota Gopinatha in Puri, and requested Sri Gadadhara ,who resided over there, to teach him Srimad Bhagavatam. As soon as Sri Gadadhara heard the name ‘Srinivasa’, he understood that he was the same personality about whom Lord Caitanya had previously mentioned about. When Sri Gadadhara Pandita understood how Lord Caitanya had appeared in Srinivasa’s dream and instructed him , his intense feeling of separation from his beloved Mahaprabhu , who by then had already disappeared, increased several fold. As Sri Gadadhara began narrating Srimad Bhagavatam to Srinivasa, he became overwhelmed with grief, and his body started trembling, contemplating on how he used to narrate the same to Lord Gaurahari ,sitting at that very place. Streams of tears burst from his eyes and fell upon the book, and as a result of which ,the letters in the book were not clearly readable.Not seeing any other alternative, Sri Gadadhara requested Srinivasa to go back to Srikhanda,and ask Sri Narahari Sarkara to hand him a new copy of Srimad Bhagavatam,and then return to Puri, so that Gadadhara could continue with his narration. Following his instructions, Srinivasa arrived at Srikhanda, and collected a fresh copy of Srimad Bhagavatam.But this time before Srinivasa could reach Puri, Sri Gadadhara Pandita, being unable to bear separation from his beloved lord anymore, manifested His disappearance pastime and entered the Nitya lila of the Lord. Hearing this Srinivasa broke down and cried piteously. All the devotees became so morose upon hearing this news that they desired to give up their lives as well. Srinivasa then reached Sri Navadvipa dham, where he spent the first few days weeping outside the house of Mahaprabhu, feeling intense separation from Sri Gauranga and Gadadhara Pandita. Srimati Vishnupriya Devi felt compassionate towards him and asked Isana Thakura to invite and feed him. Just by seeing Srinivasa , She could realize that the boy was empowered by Her beloved Lord and was the personification of Mahaprabhu’s ecstasy. ‘The Gaudiya Treasures of Bengal’ has covered the pastimes of Srimati Vishnupriya devi in a separate article entitled – ‘The worshipable deity of Srimati Vishnupriya devi- Sri Dhameswar Mahaprabhu Temple, Navadvipa (Koladvipa)’.After testing Srinivasa’s devotion and renunciation, She blessed him by placing Her lotus feet upon his head, thereby plunging him into an ocean of ecstatic love. ‘Prema Vilasa’ describes the elevated standards of Vishnupriya devi’s devotion.Everyday she would arrange for two new clay pots to be brought to her. One of them would be filled with rice grains while the other would be empty. After chanting the complete Mahamantra once (Hare Krishna Hare Krishna Krishna Krishna Hare Hare, Hare Rama Hare Rama Rama Rama Hare Hare), she would pick up one grain of rice and place it into the empty pot.In this way , she would continue chanting for nine hours and at the end of the day, She would cook whatever rice was collected in the other pot, after offering it to the deity of Lord Caitanya.She would only sleep for three hours every night.No one can guess the limits of Her exalted character.Of Course there is nothing to be too amazed, as Vishnupriya Devi is none other than the consort of Lord Caitanya.Receiving Her blessings, Srinivasa next headed towards Santipur, the land of Advaita Acharya. By that time, Sri Advaita Prabhu had already disappeared from this world and Srinivasa was confused as to where to go in Santipur.While wandering in Santipur, Srinivasa suddenly saw a tall personality, whose body was lit with effulgence, standing right before him. The hands of this person extended upto His knees. Realizing that this person was none other than Sri Advaita prabhu, Srinivasa began to shiver and offered Him his respectful obeisances. Sri Advaita embraced Srinivasa and blessed him wholeheartedly, revealing that Srinivasa was destined to widely preach the glories of the Lord. He disclosed that in the near future , Sri Srinivasa would inundate the entire country with Lord Caitanya’s love and compassion. The acharya revealed that Srinivasa was destined to accept initiation from Gopala Bhatta Goswami. He also revealed that the books that were being compiled by Sri Rupa and Sanatana Goswamis in Vrindavana would be widely propagated by Srinivasa.Sri Advaita instructed Srinivasa to travel next to Khardaha, where he could obtain darsana of Jahnava mata, following which he could proceed towards Vrindavana. Saying this Sri Advaita disappeared from his sight. Thereafter ,Srimati Sita Thakurani, the wife of Sri Advaita prabhu, arrived at that place and invited Srinivasa to accept Prasadam at her home. Prem Vilasa states that the Prasadam ,Sita Mata cooked, tasted just like nectar and anyone who honored such Prasad would immediately be immersed in ecstasy. We have covered in detail the pastimes of Sri Advaita acharya in the article entitled – ‘Sri Advaita Acharya’s Sripat ,Santipur’. Leaving Santipur, Srinivasa next arrived at Khardaha, where he was immensely fortunate to receive the blessings of Sri Jahnava Mata and Birchandra Prabhu. Sri Jahnava Mata ordered Srinivasa to travel to Vrindavana, and bring to Bengal the books that have been composed by the Goswamis. ’The Gaudiya Treasures of Bengal’ has covered the pastimes of Khardaha in a separate article entitled – ‘Kunja Vatika, Khardaha’. Leaving Khardaha Srinivasa next proceeded towards the residence of Sri Abhirama Gopala Thakura, who blessed him by striking him thrice with his Jay Mangala whip, which inundated Sri Srinivasa with a wave of ecstatic love. Any fortunate soul, who would receive the whips of Sri Abhirama’s Jay Mangala, would immediately be immersed in a spontaneous love for the Lord.The pastimes of Abhirama Thakura are covered in detail in a separate article entitled – ‘The Sripat of Abhirama Gopala Thakura-Khanakul Krishnanagar’. Thereafter paying his obeisances to Sri Abhirama Gopala and his wife Malini Devi and seeking their blessings, Sri Srinivasa Acharya left for Srikhanda. Reaching Srikhanda, Srinivasa related the news of his entire journey to Sri Narahari Sarkara, and seeked his permission to continue towards Vrindavana. Sri Narahari blessed him wholeheartedly. Thereafter Srinivasa reached Jajigram , where he consoled his mother and bade her goodbye, before continuing on his journey. We would like end this section by narrating a beautiful pastime that took place while Srinivasa was still residing in Vrindavana. Srinivasa Acharya used to meditate upon Lord Caitanya everyday. He intensely hankered for the association of Gaurahari and in his meditation he used to serve the Lord by stringing beautiful garlands for Him.One of the days, his mediation got very deep.In his trance Srinivasa could visualize the Lord singing and dancing ecstatically with His associates. The Lord was very pleased with Srinivasa and out of His causeless mercy, He gave off one of His garlands so that it could be put around him. As soon as Srinivasa was garlanded, he came out of his trance. To his surprise, he found that he was sitting there in Vrindavana with that beautiful garland decorating his body. So it was not a mere illusion. Sri Caitanya Mahaprabhu had really blessed him. The garland was strung with ever fresh flowers that did not belong to this world. Bumblebees hovered around to gather its nectar. Srinivasa was surcharged with a wave of transcendental ecstasy. At the same time he felt very embarrassed. He felt that people would misunderstand him if they saw him wearing that garland, thinking him to be hankering for petty name and fame. It was not possible for him to explain to everyone, that Lord Caitanya had blessed him. While Srinivasa was thus contemplating, the heavenly garland gradually disappeared from sight. All glories to Srinivasa acharya! All glories to Lord Gauranga ! 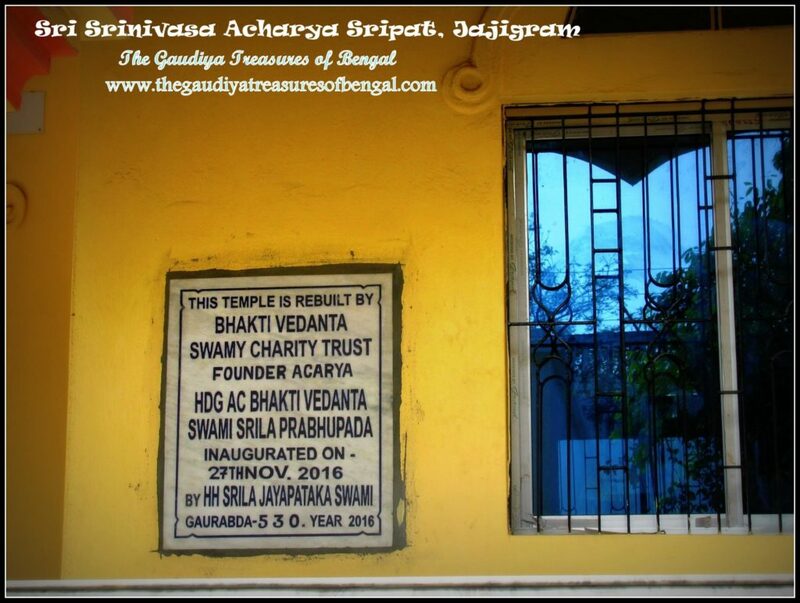 ‘The Gaudiya Treasures of Bengal’ considers itself immensely fortunate to have been able to visit Sri Srinivasa Acharya’s maternal home at jajigram, where he had spent such a significant portion of his glorious life.His maternal home here at Jajigram has been renovated and presently restored to its proper health with the help of funds from the ‘Bhaktivedanta Swami Charity trust’. Begging permission from Srinivasa acharya, we would like to narrate a few of the amazing pastimes to have manifested at this sacred place. Jajigram is the sacred place where Ramachandra Kaviraja, the great disciple of Srinivasa Acharya, first met with his eternal spiritual master.A newly wedded Ramchandra Kaviraja was passing by this place along with his wife in a palanquin. Sri Ramachandra was so beautiful that the onlookers were amazed and kept staring at him. He resembled a Gandharva. At this moment Srinivasa Acharya, who had also taken note of Ramchandra’s beauty, sighed that such a person could have been engaged in so many great services for Krishna. These words created a very deep impact upon Ramchandra’s consciousness. He soon renounced all his wealth and family and surrendered himself at the lotus feet of Srinivasa Acharya. Ramchandra Kaviraja went onto become great friends with Narottama Das Thakura and they relished each other’s association. Hence in his song ‘Gaurangera duti Pada’ , Narottama Das exclaims – ‘Ramachandra sanga mange Narottama Das’ (Narottama aspires for the association of Ramachandra Kaviraja).Ramchandra Kaviraja, is an eternal associate of the Lord and serves as Karna Manjari in Krishna’s Vrindavana pastimes. Ramchandra’s brother, Sri Govinda Kaviraja, was also later delivered by the grace of Srinivasa Acharya, who initiated him. Govinda Kaviraja went onto compose numerous heart melting bhajans like ‘Bhaja Hu Re Mana’, etc. 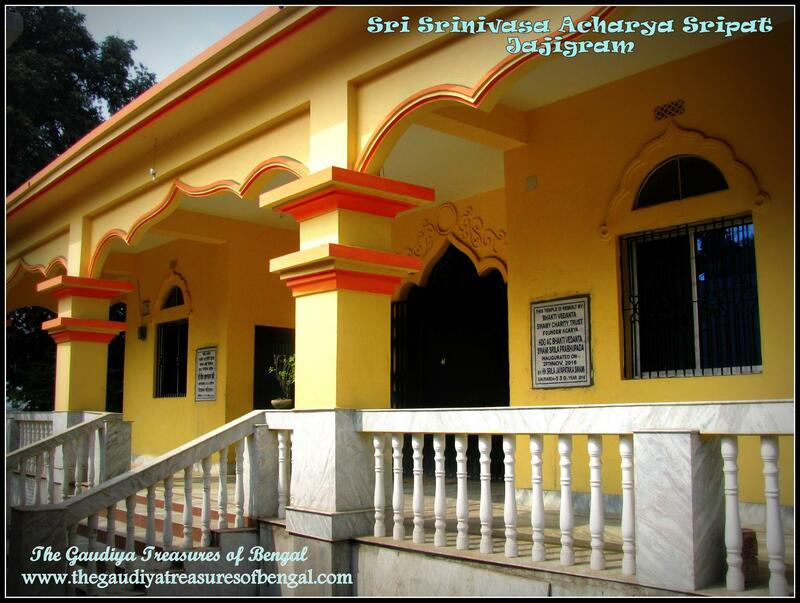 Sri Srinivasa acharya’s sripat at Jajigram is also the place where Sri Birchandra Prabhu had once arrived with thousands of his associates. The banyan tree under which Sri Birchandra had then rested still stands tall here at Jajigram. In order to feed her guests sumptuously, Srimati Hemlata Devi, the daughter of Srinivasa, enacted a pastime by which an unlimited quantity of cooked lentils were manifested from within a pond situated nearby. Srimati Hemlata Devi was herself a great spiritual personality. The sacred pond from which these lentils manifested is still visible and is commonly referred today as ‘Daaldhala’ (‘Daal’ translates to lentils in Bengali). We worship the lotus feet of our spiritual master ,whose causeless mercy has empowered us ineligible fools ,to gain entrance and take up service in this exalted abode of Jajigram. We seek shelter of this holy land, and pray that its glories remain forever imprinted in our heart.‘The Gaudiya Treasures of Bengal’ offers millions of obeisances and humbly prays to Sri Srinivasa Acharya that we advance in our Krishna consciousness, develop attachment unto the lotus feet of Lord Gauranga and are able to serve Sri Guru & Vaishnavas, by our honest and sincere efforts. We seek his blessings and compassion , in successfully rendering this humble service of reciting the pastimes and revealing the pastime places of the Supreme Lord and His beloved associates.We shall consider ourselves greatly fortunate and our existence meaningful if Lord Gaurahari and our dear spiritual master are kindly pleased with our endeavours. One of the neem toothbrushes, that Sri Srinivasa Acharya had used and then planted inside the ground, has manifested itself into a beautiful grown neem tree, which can be taken darsana today, here at Jajigram. Sri Srinivasa Acharya’s paduka (footwear) and his bhajana kutira. The tree under which Sri Birchandra Prabhu had rested on arriving here with his associates. 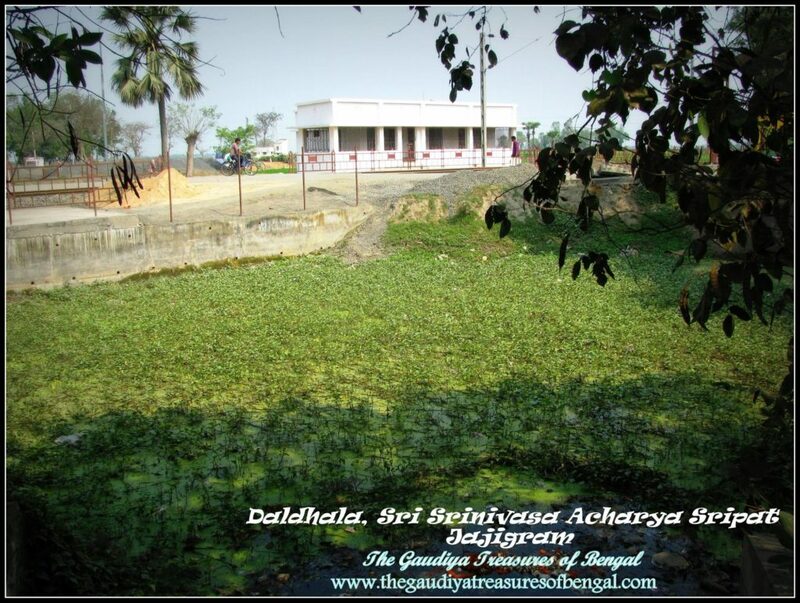 Daaldhala, the pond from which Srimati Hemalata Devi manifested unlimited cooked lentils. You can take a train from Howrah/sealdah station in kolkata ,to directly reach the Katwa junction. On reaching katwa, you can hire a cab to directly reach Jajigram. The place is quite near to Srikhanda. 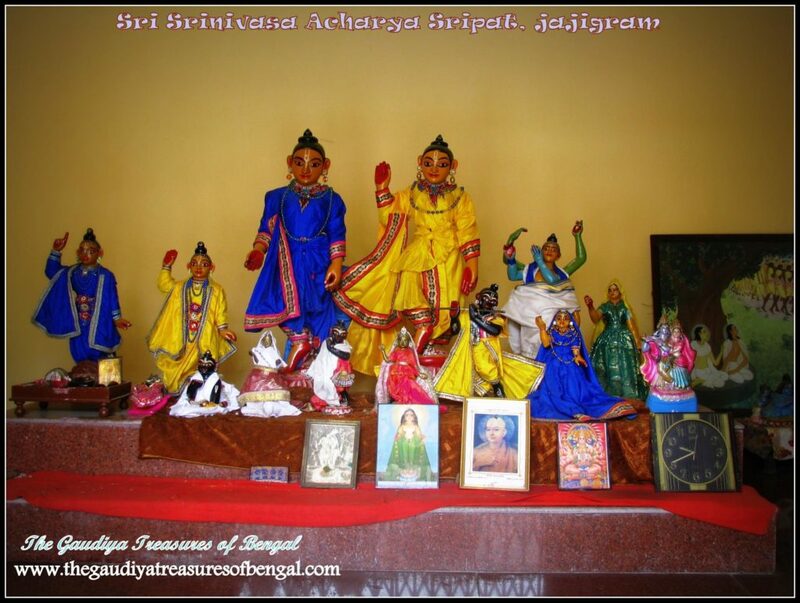 We, from ‘The Gaudiya Treasures of Bengal’ ,had visited Jajigram during our stay at Katwa. It was here in this holy land of Katwa that Sri Caitanya Mahaprabhu had accepted His sannyasa initiation from Keshava Bharati 500 years back, and is thus an exalted pilgrimage destination for all the Gaudiya Vaishnavas.This place was initially known as ‘Kantaka Nagara’,from which the name ‘Katwa’ had later evolved. The transcendental land of Katwa is a witness to several intimate reciprocations between Sri Gaurasundara, the Supreme Lord, and His beloved associates. Accommodation – One can choose to stay at Hotel Srabani in Katwa which is owned and governed by the local municipality.Jajigram and Katwa are quite near to each other. Or else, Navadvipa is hardly an hour and a half ride from Jajigram. So the devotees can also choose to stay at Navadvipa / Mayapur and then travel to take darsana of Sri Srinivasa Acharya’s Sripat at jajigram.If one stays in Katwa, one can avail prasadam at the ‘Gauranga Bari temple’. Else if one stays in Navadvipa, then he/she can honor prasadam at Iskcon Mayapur or any of the Gaudiya Mathas.